Chinese Steamed Rice Cake (We call it bai tang gao in Chinese) is a very old, traditional dessert in Guangdong and Hong Kong. 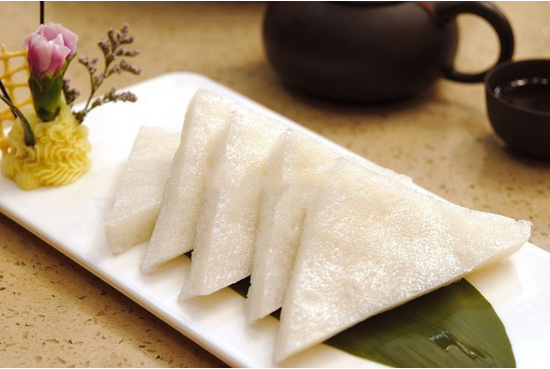 It is the dim sum rice cake available in most Hong Kong-style or Cantonese-style teahouses in Guangdong province. 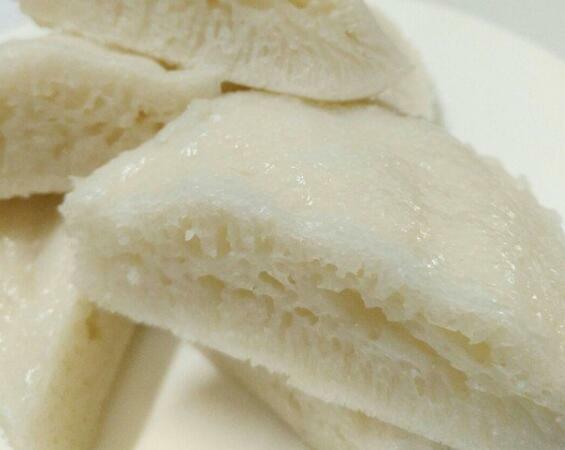 Anyone who has tasted Chinese Steamed Rice Cake will not be fooled by this seemingly bland dessert that tastes smooth and sweet. The simple white rice cake looks ordinary, but there is a lot behind it. Processing into a delicate rice slurry, slow fermentation, it has a unique preparation process and flavor profile. It may sound complicated, but by following this recipe I have constructed, you will be able to complete this fantastic treat. It is great refrigerated, and is also very good cut into small pieces for breakfast or snacks. Step 1. Rinse the rice, and then add water to soak for one night. *The weight ratio of rice to water is 1:1.5. It should be noted that there will be residual moisture on the rice after panning, so the water added later should account for the weight. That is to ensure that the total weight of rice + water is 500 grams. Step 2. The rice with water and fine sugar are put into a food processor, and mixed into a smooth slurry. Step 3. Pour the rice slurry into a large bowl. Heat up (as shown below, like a double-boiler) with water and keep stirring until the temperature of the rice slurry rises and begins to thicken into a thin rice syrup. *Heating this way ensures that the rice slurry is warmed evenly, and not too quickly so that it doesn’t get hard. The process of heating requires patience, and constantly stir until the rice slurry becomes thick. *It can also be heated in a microwave oven, however, this is not recommended. Pay attention to the temperature when heating, take it out from time to time to stir, to avoid excessive heating caused by single heating. You must also turn down the temperature on the microwave from ‘max’. Step 4. 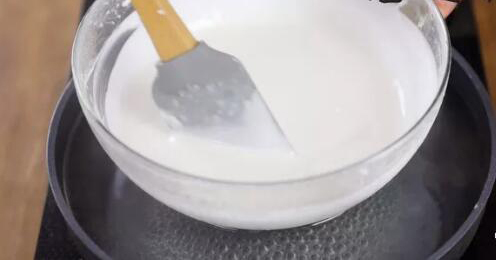 Once the rice slurry becomes thicker (the rice pulp becomes thicker and the thickness is very obvious: it is easy to feel it), and it will slowly drip in a thin line from the spatula. At this time, it is half-cooked. Cool the rice slurry. *The reason to half-cook the rice pulp is for the subsequent fermentation process. First, the rice pulp must have a certain consistency to be more fully fermented and rise; second, the starch in the rice pulp after half-cooking has been fortified, so that it will not sink to the bottom during the fermentation process. *Do not overheat the rice slurry. 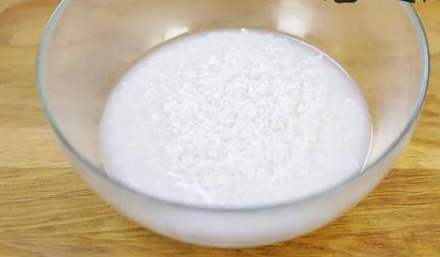 If the temperature is too high, the rice slurry will become too thick and even harden and agglomerate. Step 5. Dissolve the dry yeast in 20 grams of warm water to activate the yeast. Then pour the yeast water into the warm rice syrup and mix well. Step 6. Ferment the rice slurry in a warm place (in the summer, it can be fermented directly at room temperature. When it is cold, you can use the fermentation function of the oven, or put it in a steamer with hot water). Fermentation for about 2 hours, until the rice mixture grows 2 times (there is a large amount of small bubbles inside the rice slurry). *The fermentation time will vary depending on the temperature and the activity of the yeast (in addition, if you formulate sugar reduction, it will ferment faster). Please judge according to the actual situation to avoid over-fermentation, or it will produce a sour taste. Step 7. 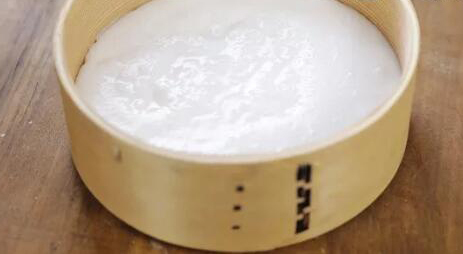 Put anti-adhesive paper on the bottom of the steamer, then pour the fermented rice slurry (do not stir the rice slurry after fermentation, pour directly). The thickness of the rice syrup is about 2cm (not too thick, otherwise it is not steamed evenly). Then put it into the steamer, steam it for about 15 minutes (depending on the size of the steamer). 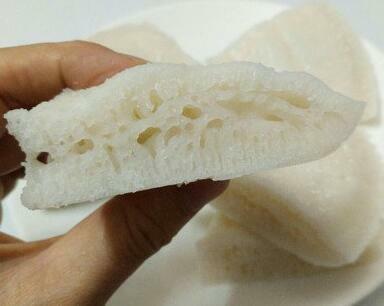 The steamed white rice cake is cooled and ready to be eaten (the taste is better after being placed in the refrigerator). 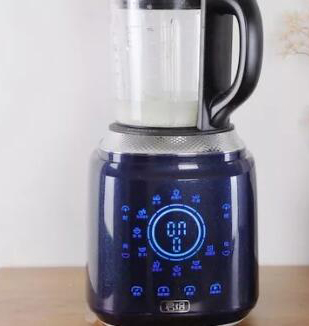 *If you do not have a steamer, you can also pour the rice slurry into other molds, such as cake mold, large crisper, pizza tray, etc., as long as it is large enough and the bottom is flat (pay attention to use something so it doesn’t stick). This white rice cake should be steamed into a thin layer. *After the rice slurry is poured into the mold, it is steamed directly on the pot, and it is not necessary to set. Step 8. Cut the white rice cake into small pieces and ENJOY! 1. The amount of sugar in this formula has been reduced appropriately so as to make the cake without being too sweet. If you continue to reduce the amount of sugar, you can make a white rice cake, but the taste will be a more glutinous. 2. It is different from other steamed cakes. Others are to be served hot and delicious. And with this white rice cake, it is recommended to put it in the refrigerator to cool it, so that the taste is the most soft and delicious.